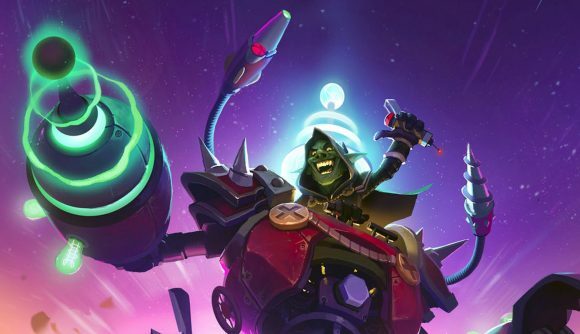 One of the most dramatic changes coming in Hearthstone’s Boomsday Project expansion almost got dropped before release. The Magnetic keyword proved so tricky to get right that it wasn’t finished until the last minute. The news from Gamescom is surprising since Magnetic is the expansion’s headline mechanic. Magnetic cards can be used to fuse mech-type items together, affording you extra statuses and effects. Ordinarily Blizzard aim to have the mechanics of a new set locked down by the midpoint of the design process, which lasts 28 weeks. In the case of Magnetic, however, the specifics didn’t come together until week 23 or 24. The initial version of the mechanic, called Modular, asked you to pick whether you deployed it as a spell or a minion. Ultimately Blizzard deemed that approach too clunky and worried it would slow the game down dramatically. Read Eurogamer’s interview for more on that, and our own guide to the Boomsday Project for details on every card coming in the expansion.